Here is your chance to join Ringo Starr in celebrating his birthday in France. Prizeo is giving you this unique opportunity, and all you have to do to get in the draw is donate to the David Lynch Foundation. 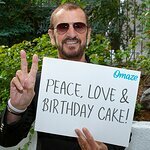 “In 2008 a TV reporter asked what I would like for my birthday and I answered, ‘If on July 7, my birthday, people would say or post Peace & Love at Noon their local time that would be a great gift to me’,” says Ringo. "Every year since I have invited everyone everywhere to say or post Peace & Love, and I have joined fans wherever I am at Noon in a moment of Peace & Love. This year I am on tour with the All Starrs so we will celebrating at the Hard Rock Cafe in Nice, France and I’m inviting YOU to join us. “For just a $10 donation to the David Lynch Foundation, who promote world peace by teaching meditation to at-risk individuals all across the world, you will be entered for a chance to win a trip to Nice, France to join me at my Peace & Love Birthday Celebration. To find out more, visit prizeo.com.